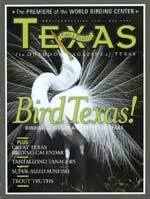 In Texas, we have a proprietary interest in cranes, since the whoopers winter on our coast. With that in mind, one photograph that’s worth the price of Michael Forsberg’s new book is a dramatically lit image of a single whooping crane standing out stark white against the whirring gray flock of sandhills taking flight from a roost along the Platte River. The book is On Ancient Wings: The Sandhill Cranes of North America (Michael Forsberg Photography, 168 pages, $45 hardcover) and it is the culmination of a five-year, 65,000-mile epic quest that started at the Rowe Sanctuary on the Platte River and ranged southeast to Cuba and northwest to Siberia. The author's photographs and text convey an amazing range of experience, from the exuberance of the elaborate mating dance to the poignance of an individual crane’s death after a collision with a power line. In between, he covers every aspect of the crane’s life story, including extensive detail from his research and personal journals.